After reviewing President Obama's budget for the fiscal year 2013, which he released in February, various lawmakers released alternative versions. None of the proposals stand any chance of passing in a split Congress, and many have already been rejected, but as symbolic documents they're a chance to put fiscal ideals on the record. Here's a look at what some analysts are saying about proposals from House Republicans, House Democrats and the Congressional Black Caucus. Drafted by House Budget Chairman Paul Ryan (R-Wis.) and passed by the House on Thursday along strict party lines, this plan would fully repeal the Affordable Care Act, restructure Medicare as a block grant, enact deeper cuts in federal spending, permanently extend the Bush tax cuts, consolidate the six individual tax brackets into two and reduce the corporate tax rate to 25 percent. "The Path to Prosperity budget tackles our generation's greatest domestic challenge: reforming and modernizing government to prevent an explosion of debt from crippling our nation and robbing our children of their future," Ryan said in a statement. "This budget … puts our nation's finances on a path to balance and pays off the debt." Yet the Center on Budget and Policy Priorities points out that 62 percent of the cuts in Ryan's budget are from programs for low-income people, such as Pell Grants, food stamps and job training. In turn, those savings are redistributed to the wealthiest Americans. "People earning more than $1 million a year would receive $265,000 apiece in new tax cuts, on average, on top of the $129,000 they would receive from the Ryan budget's extension of President Bush's tax cuts," wrote Chuck Marr, the think tank's director of federal tax police. "After-tax incomes would rise by 12.5 percent among millionaires, but just 1.9 percent for middle-income households." Introduced by Rep. Chris Van Hollen (D-Md. ), the House Democrats' plan generally follows the same framework as the president's — with new investments in education, science and research and infrastructure — and tax reform through the implementation of "the Buffet Rule." But some of the budget's cost-cutting proposals differ from the president's. Instead of making specific cuts from certain areas, such as the reductions to agricultural subsidies and federal employee pensions that Obama suggested, the plan instructs the committees to achieve certain levels of savings, leaving the specifics to them. "This budget demonstrates that we can put our fiscal house in order without blindly slashing investments and breaking our promises to seniors, low-income kids and individuals with disabilities," Van Hollen said in a statement. According to conservative think tank the Heritage Foundation, this approach employs runaway spending that fails at meaningful attempts to balance the budget and unfairly taxes the wealthy. "Echoing President Obama's budget, this House Democratic plan calls for billions in new or additional spending, including $50 billion more on transportation, $10 billion on a misguided infrastructure bank and $80 billion on education jobs," wrote Emily Goff, a research associate for the Heritage Foundation. "Couching new spending as 'investment' is still a wolf in sheep's clothing." Crafted by Rep. Bobby Scott, the Congressional Black Caucus budget also increased spending in education, job training, infrastructure and advanced research. It went on to restore the spending for community development grants that President Obama cut from his budget, made no cuts to Medicaid and Medicare and increased revenue through taxes on capital gains, a tax on those making over $1 million and the closing of corporate tax loopholes. 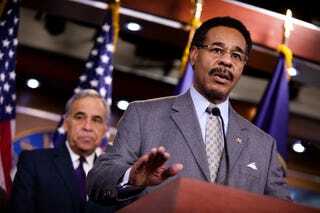 "The members of the Congressional Black Caucus believe that budgets serve as a window into the moral compass of a nation's conscience — and our nation's compass is horribly off," said a CBC release. "Recklessly cutting vital programs like job training, education and health care to millions of hardworking American families is not a road map to balancing the budget." When put to a vote last week, it failed in a 314-107 vote. As Politic365 reports, even though it was similar to the House Democrats' plan, 75 Democrats joined the 239 Republican votes against the CBC budget. Politic365's chief congressional correspondent, Lauren Victoria Burke, asked several of those Democratic lawmakers why they rejected it. "This whole process has been so diminished, just trying to keep focus on the Democratic budget and the Republican budget to me is the most important — I think everything else is sort of noise," said Rep. George Miller (Calif.). "I don't want to diminish their efforts and all that because I've always supported it, but I just think you have to recognize that the budget process has just become just so diminished, we're just trying to hold some integrity into it."